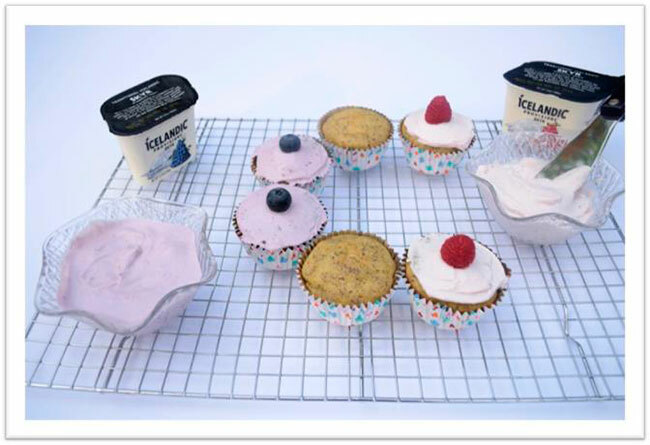 Treat your family to mouth-watering vanilla cupcakes that are higher in protein and lower in sugar! Made with skyr and flaxseed, these cupcakes are filled with wholesome ingredients, bursting with rich flavors, and are sure to become a staple in your household! Preheat the oven to 350 degrees F and line a muffin pan with paper liners. Place the butter and sugar into a medium sized mixing bowl and cream until light and fluffy. Add eggs and beat until well combined. Add the flour, baking powder, baking soda, salt, and flaxseed and mix until all ingredients are well combined. Stir in the plain skyr, milk and vanilla extract untul well combined. Spoon evenly into muffin liners, filling each cup about halfway. Bake for 18 minutes or until golden brown and a toothpick inserted in the center comes out clean. Remove from pan and place on a wire rack to cool. 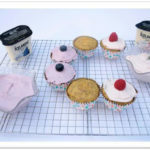 Once cupcakes are completely cooled, decorate with your favorite Icelandic Provisions Skyr and top with berries, if desired. Skyr is a nutritious dairy product from Iceland made with only the purest ingredients. Icelandic Provisions uses authentic Heirloom Skyr Cultures that have been treasured and preserved in Iceland for hundreds of years, which is where its distinct flavor comes from! Icelandic Provisions is the only authentic Icelandic skyr available in the U.S.
No Breadcrumbs? No Problem! 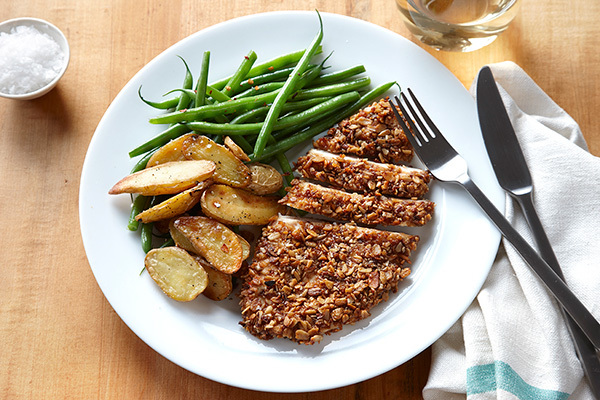 Use Granola to coat your chicken breast for a delicious new twist. Viki’s Granola is nutritious, delicious & made with 100% ALL NATURAL ingredients, gluten-free, minimal added sugar, and baked with love! Do you like to get creative when making meals for your kids? 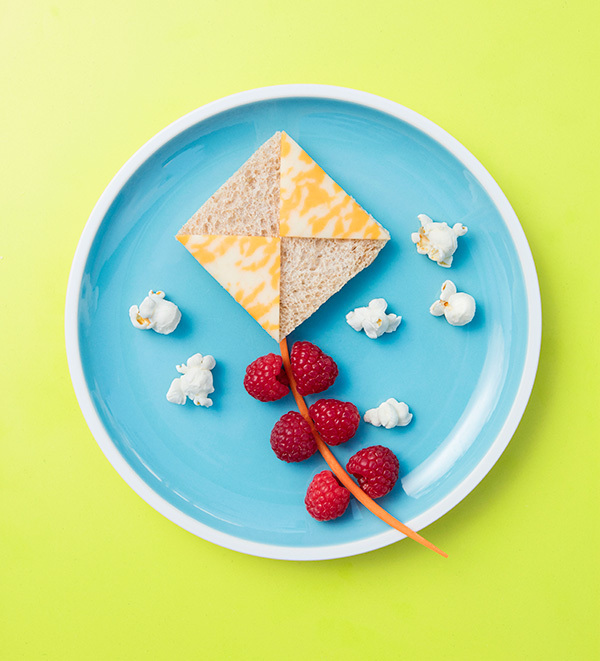 Below you will find a super-cute kite-themed snack courtesy of FamilyFun magazine. Do you like making dishes with chickpeas? 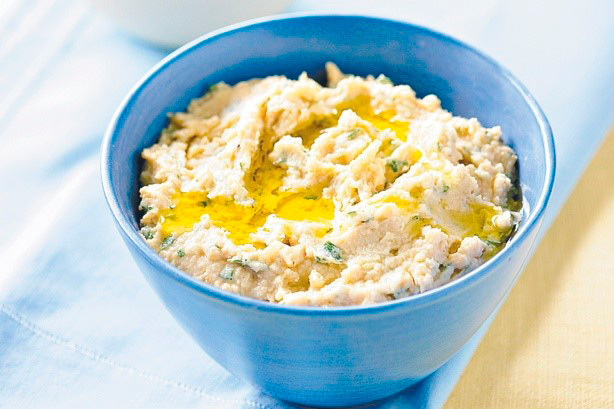 In celebration of Mediterranean Diet Month find an easy and delicious recipe for a chickpea spread that you are sure to enjoy that features Greek extra-virgin olive oil that is used in everyday Mediterranean dishes including appetizers, breakfast dishes, dinners and even dessert!